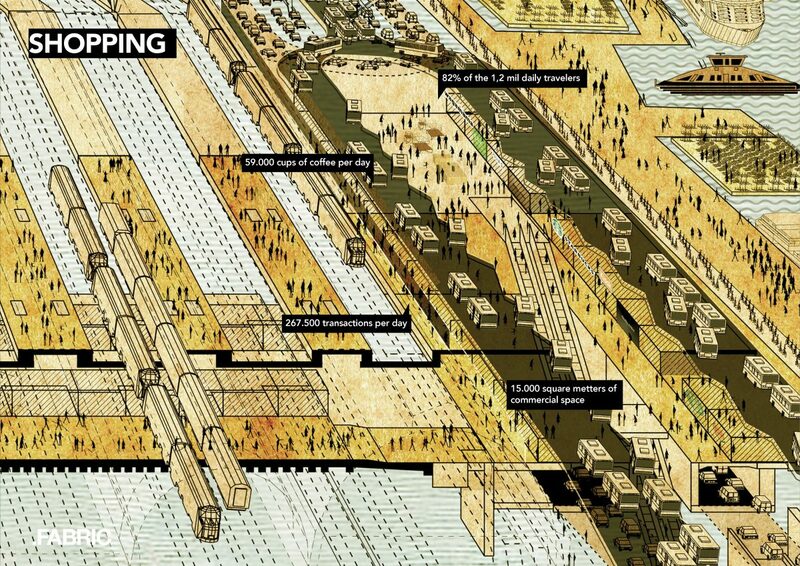 Stationseiland is an investigative project on Amsterdam Central Station, developed for the Stadforum 2015. 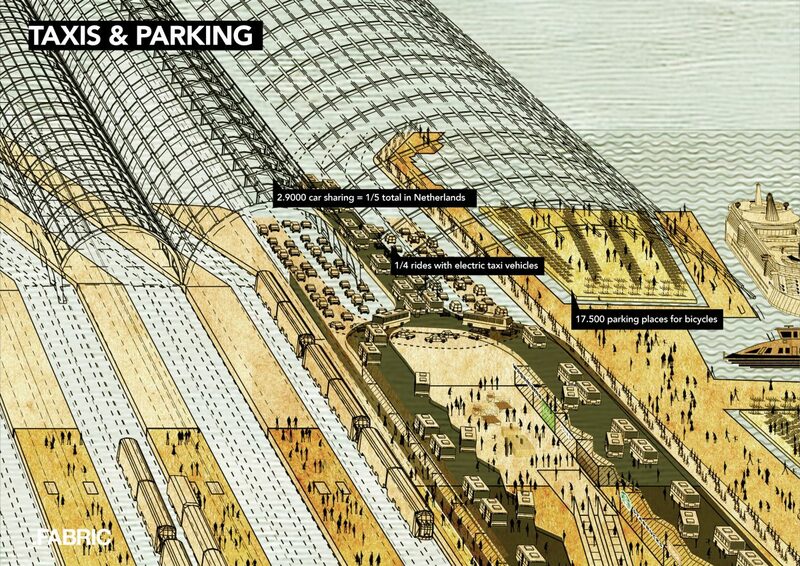 The station is a complex combination of flows of people and transports, a crucial transit hub, as well as a destination itself, with shops and services. 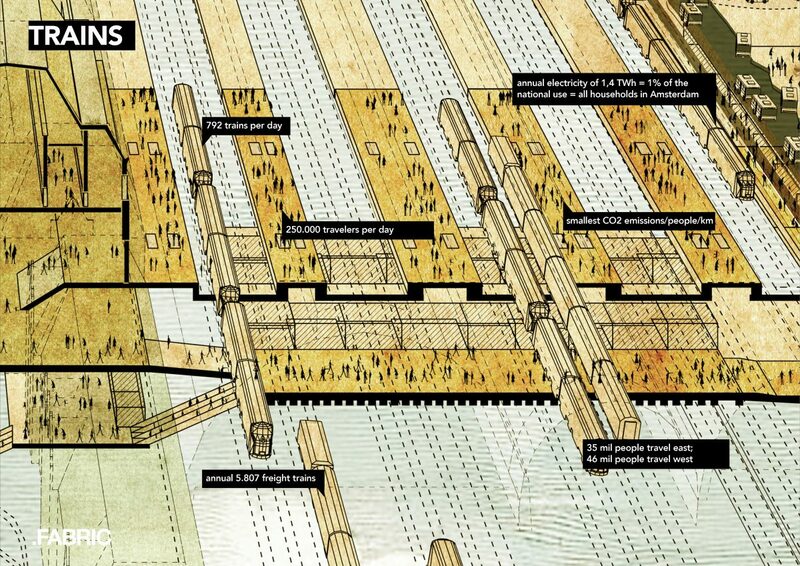 In this project, the flows that cross the station have been unpacked and represented in a spatial outcome, not only displaying the dual nature of this complex system, but also showing potential alternatives to improve the coexistence of different programs. 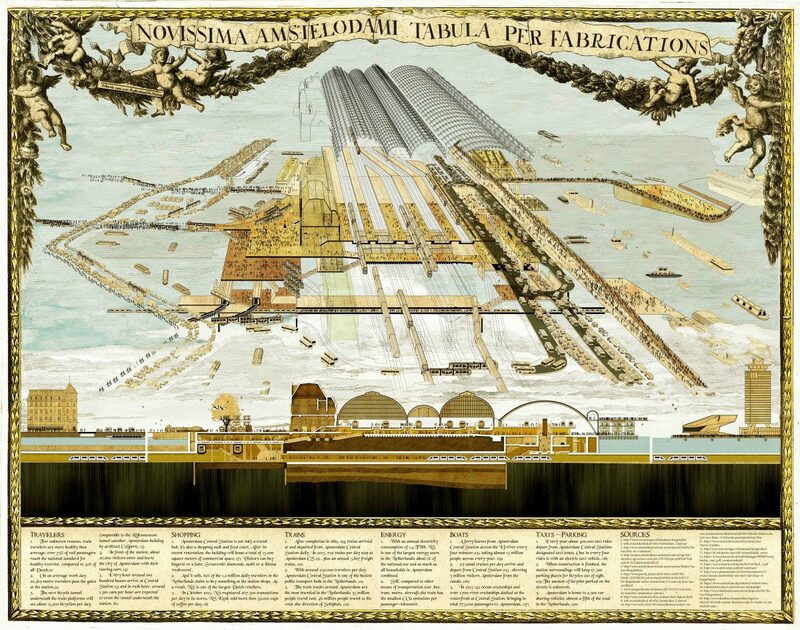 The drawing was used in this project as an investigative tool, describing the central station graphically as a machinery, with complex functions and components. Historical images and drawing references were used to create a language that unpacks and combines the different layers of information, which came together in one large image. 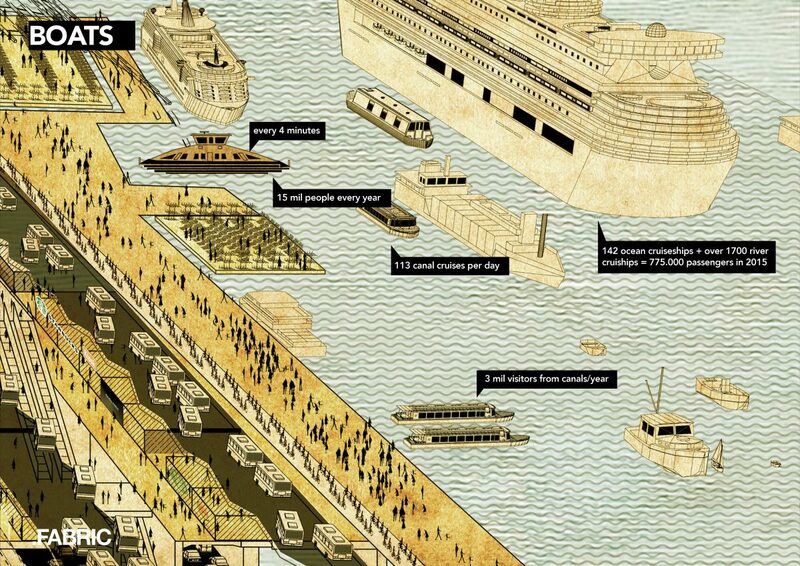 In the drawing, flows of people, trains, ferries, boats, bikes and busses were represented graphically to emphasize their spatial impact. 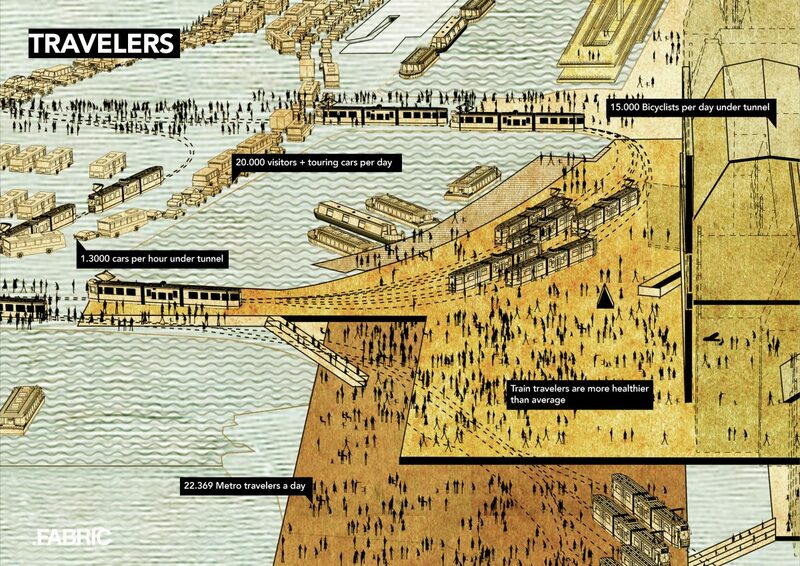 Amsterdam Centraal is the result of numerous transformations and adjustments, an entity undergoing continuous change. The station was in fact created on an artificial island, and was transformed and expanded multiple times over the years. In addition, the back façade, which faces the Eye, historically neglected, has only recently transformed into an active part of the complex. Reacting to the problems that emerged from our assessment, we developed a speculative design variation for this particular area of the station. The north side of the station can be characterized by the contrast of two present flows, which are very different from each other. A fast moving lane for bicycles, which enables them to move from one side of the station to the other quickly and directly, and slow moving pedestrian traffic gathered around shops and ferry terminals. We came up with was included in the drawing as a schematic design for an elevated bike bridge, travelling on a much higher level than the pedestrian area, keeping the flows separated. Taking advantage of the height of the our proposed bike bridge, it could also connect to the other shore while providing a clear route for boats and ferries underneath. Only a small segment of the bridge would need to be moveable for large vessels and cruise ships, and would rotate on a floating platform in the river. Opening once a day, the moveable bridge would become a spectacle for the people sitting at the café on the platform, or for those observing from the shore, allowing transit of the large boats. 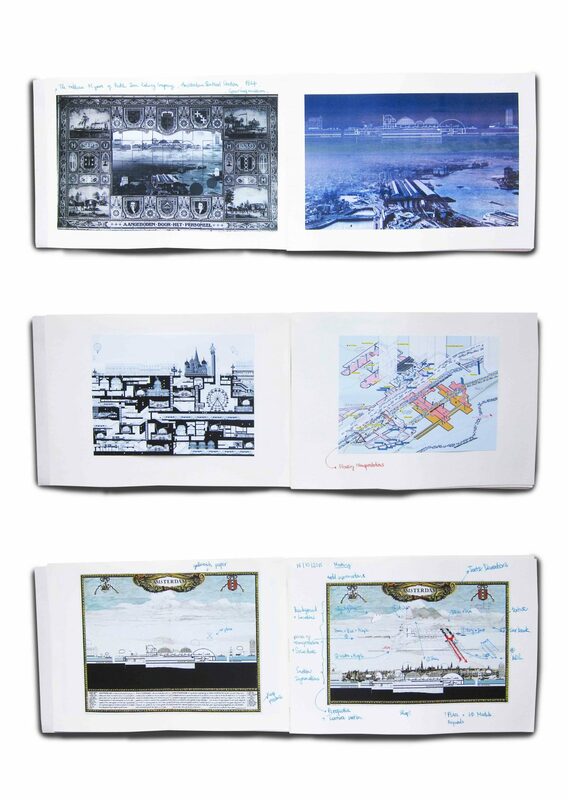 The drawing was presented in the central station to experts and city administrators, as part of the Stad Forum 2015, and it is currently part of our private collection of speculative visual investigations on the city of Amsterdam.